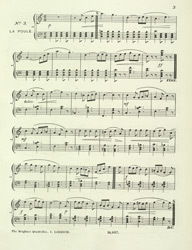 This music sheet has a beautiful illustration of Brighton pier in the moonlight. A large number of men and women can be seen enjoying the entertainment and amusements on the pier. Brighton has had three piers in its history, this one, the 'Palace Pier' was built in 1891. It was designed by Richard St. George in the oriental design that was popular at the time, similar to the design of Brighton Pavilion. A concert hall and a dining hall, were built and it was a popular venue for concerts, pantomimes and comedy acts.